Christmas in Germany is very similar to Christmas here in the U.S. Germans put up a Christmas tree and decorate the house, both inside and out, with Christmas decorations. The Weihnachtsman, Germany's version of Santa Claus, is a symbolic figure representing the gift-giving that takes place between family and friends. Likewise, Christmas music is an important part of the season. Here we discuss some of the German Christmas traditions, with an emphasis, of course, on the food. The Christmas meal in Germany is a very important part of the Christmas celebration. This is usually an extravagant, multi-course meal enjoyed on December 25th. On Christmas Eve, December 24th, a simpler meal is served. Advent is a very important part of the Christmas season in Germany. For Christians, Advent-time is the four weeks before Christmas and represents the waiting for the birth of Christ. For non-Christians, Advent is a time to prepare for the Christmas celebration. Advent is celebrated on the four Sundays preceding Christmas and ends on Christmas Eve. 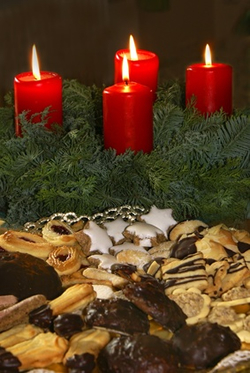 The time of Advent is filled with many traditions in Germany. The Advent-Wreath (Adventskranz) is a very important part of Advent-time. It has four candles and each Advent-Sunday a candle on the wreath is lit to represent Christ, the Light of the World. Equally important, especially for children, is the Advent-Calendar. This is a calendar with 24 tiny doors that counts down the days until Christmas. Everyday a door is opened. Behind the door can be a cartoon, a small toy or gift, or candy or chocolate. Advent is also the time to decorate the house for Christmas, both inside and out. This time is also used to bake Christmas cookies, cakes, and other sweets. We have listed many of the traditional baked goods and sweets (right) that are so well known throughout Germany. A very important day for children during Advent is Nikolaus Day (Nikolaustag), December 6th. On this day, Nikolaus is said to pass by and leave the children candy, chocolate, fruits, nuts, or small presents in stockings or boots that they've placed outside the front door for him. Historically, Nikolaus represents Nikolaus von Myra, a bishop from Asia Minor (Southern Turkey), who died on December 6th in the 4th century. Not too much is known about this man, except that he was known for his kindness and good deeds, especially toward children. December 24th, Christmas Eve, is the last day of Advent. On this day, many people go to church or attend a midnight mass. Also, many families choose to exchange their Christmas gifts on this day. Christmas Markets in the U.S. 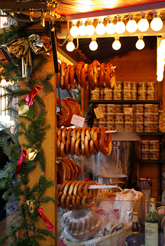 In Germany, each family has its own food traditions for the Christmas holiday. However, here we list some of the most popular Christmas foods.